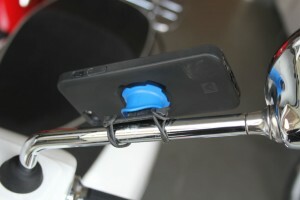 I’ve tried various Smartphone cases designed for use on a bike/scooter but they’ve always been a compromise of style, practicality and awkwardness. 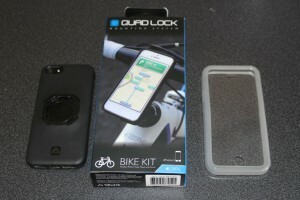 That was until I discovered Quad Lock, the perfect way to attach your phone to a cycle, bike or scooter. Quad Lock is very simple; it’s a silicone type phone case with an all-important four pronged cut out in the rear. The case itself is as good looking as any aftermarket phone case I’ve ever used and it hardly adds any bulk or weight to your phone so it still feels the same and looks good, so you can fit the case and forget about it. 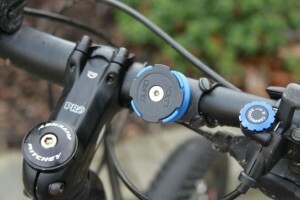 The second part of the Quad Lock is a dock to fix to the stem or handlebars of a bike. It takes 30 seconds to fit using the ‘O’ rings or tie wraps that are supplied. Once the dock is in place you simply put your phone into it and twist, that’s it, locked in place nice and securely. There’s also a waterproof ‘poncho’ to put over the phone if it rains, or you’re out in some muddy terrain. The poncho leaves the touch screen fully functioning. I’ve been using the Quad Lock on my mountain bike, it’s attached to the handlebars and despite some serious off road abuse the phone has remained in place and I can keep an eye on my Strava activity whilst on the move and get to my phone quickly and easily if I need to use it (removing your phone is just a matter of pulling a spring mounted release and twisting the phone, simple). The dock will fit to a motorcycle handlebar or scooter mirror stem just as easily as it does a cycle and there’s also a car mount available. The thing that makes Quad Lock such a good mounting option is that it is just so simple and easy to use, it also leaves your phone looking just as good as it would in an ordinary case. Without a doubt this is the best way to mount a Smartphone to a bike, no fuss, no hassle and it’s a great quality product as well. In fact I like it so much I’m going to order one for the missus as well so that she doesn’t nick mine.